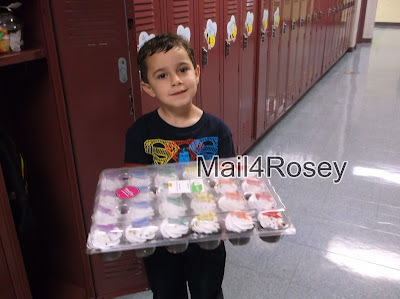 Mail4Rosey: Woohoo, My 'Baby' is 6! The other day I wrote about a day outing my son and I took to see a movie (where we learned about the D-Box experience). That day was more than just a fun outing, it was also my little man's birthday! Everyone had something to do until dinner time, and I'm far too antsy to wait that long to celebrate. So...we took in a movie, and then went to lunch at the Texas Roadhouse. 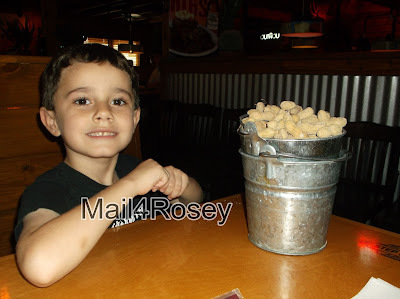 We don't have that restaurant close to where we live, so my son was delighted to find out he could eat peanuts and toss the shells on the floor when he was done. I heard once that the peanut oil is good for the floors. I don't know if that's true or not, or even where I heard it. Another big event happened this week...school started! Little man is repeating Kindergarten again this year...our choice. This was such a hard, hard, hard decision for us. The teacher left it in our hands last year whether or not to pass him. He was doing fine with his work but was noticeably under-confident in doing it. I saw the same thing on the soccer field. He was basically a year younger than everyone else (he's on the birthday bubble), and that can make a huge difference in Kindergarten. I saw that with my own two eyes. A big thank you to Joyce from Catch My Words who gave me so much clarity and help when I was trying to make this decision!!! Joyce is a school teacher, and she was a big, big help to me on making one of the most difficult decisions I've ever made regarding my youngest. I knew in my heart of hearts when I made the decision it was the right one. Just a couple of days into the school year, I've had that reaffirmed several times. He is already showing confidence this year (he knows what he's doing this go around), he's the same size as everyone else now (lol! ), and it's just the right fit. He's having a fun birthday more than once this year. I like that. I'm glad he's having a better school year too. That's so important. Ah...a woman after my own heart! I knew I like you, Rosey! The cupcakes look beautiful, and so does the little boy holding them. I'm so glad that you feel good about your decision, especially a hard one that requires serious soul searching! A Happy Birthday and cheers to a good school year! High Five to a fellow Bakery Buyer, wooooot! :) Someone's gotta support those ladies who bake for a living. ;) Thanks for the well wishes to my little guy. Thank you, Monica. The curriculum really is no joke, they've got those kids reading, writing, and doing their Math half way through the Kindergarten school year. While that's amazing (compared to my own half-day, play-time Kindergarten experience) it's also intimidating if you're not ready for it. He's going to be just fine this year, I can feel it. :) Thank you for your kind words and well wishes! Happy birthday to your little guy and honestly sometimes we have to make the hardest choices as parents, but so glad this one seems to have indeed been the right one for him. I'm so happy for him! Happy Birthday lil' man! I couldn't help, but hear his name in the video, and I love it! I think you made the right decision about him repeating another year of Kindergarten. Mica's birthday is in Aug. I waited for him. I had my doubts with/when to send him to the big K. Let's hope now he can be a leader in his class (since he knows what's up). Your boys have great names, both of them! I think we made the right decision to repeat here. I'd rather have him a tad ahead than a tad behind. BTW schools here won't let us make treats to send to school. I get it. But the odd thing is that the PTA board has bake sales all the time. Such a contradiction. It makes me giggle a little; at how some rules work. Indeed! Cake's on the house (if you're in his kindergarten class today ;) ). Awww happy birthday to your baby! I'm glad that he is more confident in school this year. Sounds like you definitely made the right decision in his education! Although I'm sure it was so hard. Thanks, Tammy. I'm happy for my little sweet guy! Awww! How sweet! 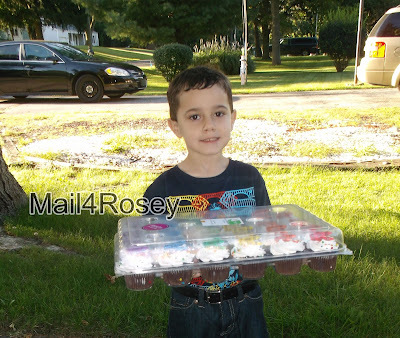 I'll take one of those lovingly homemade cupcakes :) Happy Birthday to him! Happy Birthday to your Son! the photos are wonderful. I loved the video! He doesn't look shy at all lol. Happy Birthday kiddo! Hope he had a great day! Last year he was hide behind me, hold my leg shy if even the neighbors came in to visit. He's getting less and less shy all of the time. I'm glad too (for his sake). Hope he had a great birthday!!!! Texas Roadhouse and Hard Rock Hotel by the pool, you know how to live sista'! Hahaha... cute video Rosey. LOL.. so funny. Happy Birthday to the Little Man. Thanks for the birthday wishes, Terry. He didn't smile about it until lunch was over and we LEFT the building. Then he was talking non-stop about it for a few, hahahahaha. Happy birthday little man ... 6 woo hoo!! I think repeating kindergarten will be great for him. Especially since it will most likely give him the confidence he needs going forward! Thanks, Lanaya. I really am confident it was the right decision. I feel good about (for him!). What a very wonderful post. Happy Birthday to your son! He is so cute, and I liked his belt. Wow! What a nice thing that he got to bring these delicious cupcakes to his class so he could share them on his birthday! First, he's sooo cute. Second, I'm so glad to see other parents doing this. I completely get the whole birthday bubble and how it affects their maturity and the ability to relate with their peers. Good for you, mommy! Thanks for the support. No idea why a decision that should be so easy to make was difficult, but it was there for a bit. And kudos to you, I'm sure having him repeat kindergarten was a hard decision to make but he will benefit from it. Both of our little guys are in kindergarten! Awww looks like he had a wonderful birthday!!! Happy birthday to your little guy. Happy sixth birthday! I love Texas Road House. YUM. I'm glad he's had a great start to the new school year. I know he'll do fabulous. Thanks for the shout out. I'm sure in the end, you made the right decision.You know your son and his abilities better than anyone. I do feel like that's true. Thanks, Binky. :) I'm headed over to see what your wombat's up to. You said it, sistah! I am soaking these years up and enjoying every last drop. My second oldest called today to tell me hi on his way to work. SIGH Seems like he was in Kindergarten not long ago. no joke. What a little cutie! And a keeper, for sure. Looks like he had a lot of fun. Almost makes me wish I was 5 again. I LOVED kindergarten, I wish I repeated, hello nap time! Happy Birthday to the little guy. My little man turned 6 on August 16th and he went into first grade this year. I debated keeping him back, but after several conversations at length with his teacher, I decided to send him on his way to first grade. He's only gone for 2 days, but I think he's gonna do just fine. Awww happy birthday! My oldest is now almost 9! wow it seems like just the other day she was 6! time sure does fly. It does, no doubt about it. Aww, happy birthday to your little guy!! I'd definitely make the same decision about kindergarten. There's no need to push them in my opinion. What's an extra year in school, if it will save them from feeling behind and younger than everyone in their class? Happy birthday to him! The extra year is bound to build his confidence! Thanks, Melissa. We don't head up that way much, it was a nice treat. Happy Belated Birthday to your son. I am happy he had a great time. Happy belated birthday to your son. Looks like he had a good one! We have a Texas Roadhouse where I live. It's been in business for a little over a year but I haven't been there yet to eat. I hear they are great with recognizing birthdays. My now 15 yoa son was held back when he was in Kindergarten. I fretted about it when it happened but I'm so glad now that I made that decision. The only downside is that he's now in the same grade as his 14 yoa brother and everyone assumes they're twins. Thanks for sharing your birthday boy at our Thursday Favorite Things Blog Hop. They grow up so fast. We are coming up on 2 years old and it has just flown by. I agree, Angel it flies right by, so I'm making sure to enjoy it/him! He's already outgrowing so many things! They grow up so fast! I can't believe mine is about to be 3. I don't know where the time went.